Salmon caught on Harrison rod. Review of the Harrison salmon rod. The moment had finally arrived There I was with half a rod remaining in my hand, a bird’s nest big enough for an eagle, and the top half of my rod floating away through the waves. I’d had five seasons service and some eighty salmon from my Tri-Cast before it had exploded at the ferrule mid cast! Having just arrived on my annual pilgrimage to the Rangitata River what was I to do. Back to my old Graphcast or fibreglass rods and the Abu 10,000 – I don’t think so. Two days earlier a fellow had turned up at the mouth from Christchurch with this new 13′ shiny stick which instantly caught my eye and when I enquired the reply was simple, it was a “Harrison” from the Fisherman’s Loft I had managed to have a hold of it and it felt superb, but as my old rod was still casting okay I didn’t want to seem to anxious as he could already see how annoyed I was at continually being outcast during the day. Luckily enough a friend of mine in Australia was flying in the next day so I had already decided. I want one! I finally found the shop in Riccarton Road (the shop has now moved to Addington) after driving around for three-quarters of an hour I was born in Timaru and moved to Australia some fifteen years ago, so I can be excused. I found the Harrison’s just inside the door and had been fondling one for about five minutes before the salesman came over and said “Can I help you Sir” I’ll have it! He seemed rather perplexed that I hadn’t asked the price or anything about its performance and construction, I was in the van and halfway back to the Rangitata River before he got the receipt out of the till. Having been a salmon fishing addict for the past 20 years, I had built many a rod, spent many an hour perilously casting from the point spent thousands of dollars on equipment and air travel to and from New Zealand twice every year for most of November and all of February. I knew what I had just purchased. The next morning couldn’t arrive soon enough. I fished the next two days spending at least 24 hours on the water for no result. I was amused at how easy the transition from 12′ Tri-Cast to the 13′ Harrison had been My Daiwa SL 20 SH matched perfectly. The fish were simply not around, however, the next day would be different. I have always been a long distance caster but the regulars at the mouth were getting inquisitive as to this new rod and where it had come from By the end of the day the envy would grow. As the tide was receding I could sense a hook up was eminent I fished for another half an hour before bang! I was on. Initially, I felt like panicking, a new rod. The first fish for the season and the fish had cut across into the river current and was taking more line than I would have liked. I line tuned the drag and it was on for young and old. It was a beautiful calm sunny day and the sight of the silver master leaping too and fro had everyone looking. Finally, I played the fish out. So what was my secret? It’s a Harrison! Just as I was about to pick the lure from the water it was attacked by a silver `flash that took off like a steam train. Luckily the drag was lightly set as the fish kept going taking about 50 meters of the line with it before slowing. I was able to play it out without too much of a problem. For some reason, I had never in 20 seasons been able to land a fish over 30 lbs but the day had finally arrived. I set off and had the last fish weighed. The result was 14.9 kgs. I was ecstatic. For the season my tally was 14 salmon all in the surf on the Harrison. There was a number of days when I picked up two and nobody else could get at them. 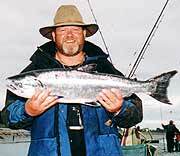 For the 14 fish, I collected the Anderson Trophy for the Heaviest Fish for the Season South Canterbury Branch of the New Zealand Salmon Anglers Association 14.9. Special thanks to Dr Harrison. Please note that the rod component prices quoted in this article may no longer be correct. 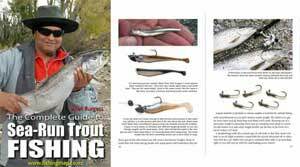 Salmon anglers who dream of that mighty long distance cast need look no further. Harrison Advanced Rods in the United Kingdom have produced a 13′ salmon/surf rod in time for the salmon season. Very limited supplies have been produced to special order for New Brighton Sports, Christchurch. These are 3.95m (13′) 2 piece, three and a half pound blanks, made of high percentage graphite with a 3K woven graphite overlay. The final blank has been finished with a translucent brown epoxy coating which looks particularly attractive in the sunlight. The blank is a full 13′ which should give a little extra leverage for a longer cast! We have included a full parts list for those contemplating building the rod themselves, or if you prefer New Brighton Sports offer a full quality building service to provide you with a completed rod ready to fish. The cost of this service depends on the final specifications. Some anglers may prefer to use higher quality Silicon Carbide guides throughout.